Water temps are slowly coming down on both the Green and New Fork. The rivers are in great shape for some great fall fishing. A lot of people think Western Wyoming runs out of water this time of the year, but we’re still in great shape! We have over 10 Full-Day Float options on the Green and New Fork River, so come on by and learn why September is many of our guides’ favorite time to fish! 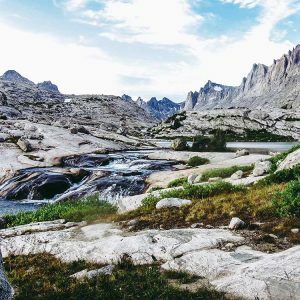 Two Rivers Fishing Company is the only local full-service fly shop and guide service in Pinedale, Wyoming. Our local rivers (the Green River and New Fork) get fished a lot by “outsiders,” so if you’re looking for a home-town guide that fishes this water day in and day out, give us a call. 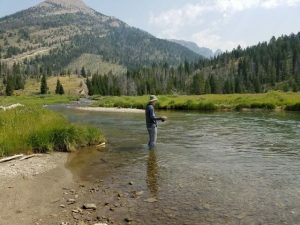 With walk-wade trips on private creeks, ponds and lakes, half- or full-day float trips, fly fishing lessons, backcountry fishing trips into the legendary Wind River Range, as well as custom fishing trips to fit specific plans you may have, we are the proven authority on fishing the Green River valley. Our fully-stocked fly shop has you covered if you are in the area. We have thousands of flies, a wide selection of rods, hats, sunglasses, jackets, waders, reels, etc. Stop in! Private Water: Cottonwood and Hocker’s were fishing the best over the last 7 days. If you’re looking for a private section of water and some hungry fish, ask about these options! Our local private streams have some of the best water in Sublette County and they do not get over-fished. Ask about Faler Creek where you can catch 20-inch or larger Browns, Rainbows or Cutties. Or come check out Cottonwood Creek, where you can catch dozens of native cutthroat. We also have Hocker’s spring creek and pond where it is a sure bet you will be fighting fish and have a chance at a true 5-pound rainbow trout. We have another section on Muddy Creek that offers over 2 miles of small stream and big fish combos with 3 holding ponds that offer a high population of trophy-sized browns, rainbows and brook trout. A guided day can also be on our Big Sandy lease where you will be fishing in and out of pine trees and true mountain scenery. 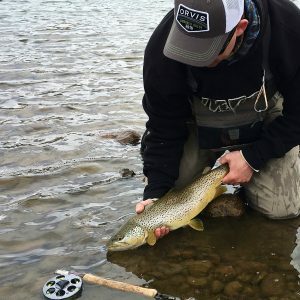 The moral of the story is that we have some of the best exclusive fly fishing in Pinedale, Wyoming right at your fingertips with these private leases. No crowds and plenty of big fish. Call us up-we would love talk to you about some of these exclusive options to make your Wyoming fishing trip memorable. 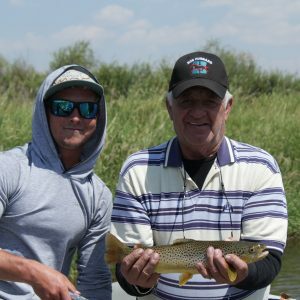 If you’re looking to catch big browns on a dry fly, 16-20 inch brookies, Colorado Cutthroats, or an easy-going, family-friendly setting where everyone can catch fish-we’ve got you covered. Call us today to talk about these options. No BS-find flies with serious street cred. Have you been in and noticed the new Guides’ Choice flies? Each week, our TRFC guides will personally pick proven patterns that they stand behind for current conditions, so you can hit our enormous fly selection with confidence. These hot flies will be rotated weekly based on our guides’ preferences and successes, and is just one more way we show our clients and customers that we stand behind our local knowledge and experience. This week’s Guides’ Choice flies are hand-selected by our management team, so pop in to see what top guides personally use on the water. The Green River is fishing well and flows have dropped to the low 200’s this week. We are entering into our fall weather pattern with cold mornings (avg. 32 degrees) the last week and hot afternoons pushing into the low 80’s on a few days. The fish have been eating big dries and dropper rigs and the fishing has been good! Fishing is better in the late afternoon then at first light. We have been floating everything below Daniel and doing well. This time of the year fishing starts to improve as the cooler nights and fall season approach. We have a few openings this weekend and early next week if you are looking to experience some solitude and wild trout! Stop by the shop to see the most current flies we have been using! Ask about our fall float fishing-it may be your next favorite fishing adventure. Many of our guides love this time of the year! The river is starting to produce some good fishing again. Flows are low and the water temps are headed down and are back into a healthy range. Fish are looking up at big dries, but are very spooky. If you’re looking to test your dry fly game on some nice sized fish, this river may be your ticket! Call or stop by for an up-to-date report and selection of flies. We have had guides out on this water in the last week and can get you dialed in on this river. Bring along a long leader and downsize it for our Wyoming specs-you may have to go 4X or even 5X at times. We are getting a good trico hatch on both rivers, but not many big fish eating them yet. A nice brown from a Float Trip with TRFC Guide Jesse! Working under Wind River Troutfitters, LLC, TRFC offers guided float trips on this fishery. We currently have 2 guides that are permitted to run this section, so call us up and we can get you there. The fishing has been good under an indicator with scuds, sow bugs, worms, and hot bead nymphs. Streamer fishing has been okay- some days better than others. It takes a committed angler to keep working a streamer rig, but those who stick with it can finds some nice fish. The underwater world of nymphs and worms have been working the best. We have also had some crayfish eaters lately! The dry flies are spotty and mostly working for smaller fish, but if you want to dust off some 5X and dig out some size 18-22 tricos-you can catch some fish that way, too. The next month should really start to offer some great fishing, so book now if you’re thinking about a trip to Seedskadee. WE HAVE LIMITED OPENINGS LEFT FOR OCTOBER FISHING ON THIS WORLD-CLASS RIVER! SPOTS ARE LIMITED TO ONE ANGLER A DAY ON THIS SECTION, SO CALL AND BOOK A DATE! Soda Lake is going thought a ‘not-so-great’ phase right now. About 20 days ago an algae bloom came over the lake and really messed up the fishing. The fish are still feeding on the surface in the morning and evenings, but the fishing is really tough. We are hoping this doesnt last much longer, but our guess is at least 2 more weeks. The cooler temps should help. Check with us if you’re planning a trip to Soda. This lake usually becomes a favorite for many this time of the year, and we are crossing our fingers that things improve before it closes for the season! If the oxygen levels get too low, we could see a fish kill, which nobody wants. We are monitoring the situation at the lake, so call for updates. September is booking up fast, so don’t miss an opportunity to experience the best fishing Western Wyoming has to offer, with our expert guides. Book your fishing trip today! Green River: Flows at the Warren Bridge gauging station are 225 cfs. New Fork River: Flows at the Highway 351 gauging station are 300 cfs. Seedskadee: Flows at Fontenelle are 1040 cfs. New Gear: TRFC got some new rods in this week. We have a casting area behind the shop if you want to try casting some of these new rods. The Sage X against the Wintson BIIIX is a fun casting comparison. Fly of the Week: Chubby Chernobyls! Red and Purple are great options! Float of the Week: Chubbies on the Green. Hot off the press: TRFC custom-tied leeches and new Guides’ Choice Flies should definitely be checked out! Check out the new TRFC branded hats-they are rad! Rods and Reels: If you need a streamer fly rod check out the Temple Fork series we have in stock now. This is a monster streamer fishing machine for under $300- we have a 6-weight waiting for you, and our streamer season lasts all year long! Best Grub in Town: Los Cabos Burgers on Tuesday! $8 burgers are hard to beat, and their service is fantastic. As always, pop in the shop and check out the largest selection of flies in Sublette County, and get the most up-to-date fishing conditions firsthand. ‘Til next time: Row On!